Aug. 31, 2016 marked the inaugural International Overdose Awareness Day here in Kamloops. Sherry Robinson, mother of Tyler Robinson, 23, who died earlier this year due to a fentanyl-related overdose, initiated the campaign for International Overdose Awareness Day by setting up a booth at the Kamloops farmers market downtown. 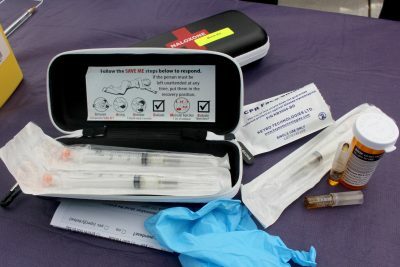 International Overdose Awareness Day has been functioning as an international event for 10 years, commencing in Australia. “This year it has spread exponentially throughout the globe,” Sherry said. According to Sherry, “the support has been fabulous,” as there was an overwhelming response from health and drug abuse services from the community. Reports by the Canadian Center on Substance Abuse confirm deaths from drug overdoses are on the rise across the country, with a sharp increase in the western provinces and there is an increasing emphasis being put on awareness. Jeff Conners, who has worked as a counsellor and health educator for over 20 years recognizes young adults, particularly males, as being at greatest risk. “I think we’ve finally got a saturation point in the country around the narrative that you can talk about this stuff without stigma,” added Conners. Sandra Tully, mother of Ryan Pinneo, 22, who passed away after a fentanyl-related overdose was also present at the campaign. Tully wants to raise awareness regarding these specific type of drugs and wants conversations to start penetrating the universities and high schools around B.C. She highlighted that it is almost impossible for someone to know what is in their drugs right now. “We’re dealing with something that you can’t even know you’re taking,” Tully said. Her son Ryan died earlier this year after taking half a pill of what he thought to be an oxycodone pill, which he had been known to take in the past. After receiving the toxicology report, the results showed the pill he had taken may have been made up of pure fentanyl. As little as two grains of salt worth of fentanyl can be fatal, Tully said. “We’re just a normal family. We took our kids to Disneyland, they went for swimming lessons, [and] they played on sports team. This happened to us. This can happen to any other family. it’s the risk of experimentation,” Tully said. Fentanyl is an opioid that is prescribed to patients as an extremely potent painkiller (up to 100 times stronger than morphine). Recently, fentanyl has been found more frequently in street drugs. The drug is commonly mixed with other popular drugs like oxycodone, ecstasy and cocaine. Reckless use of any drug, even alcohol can be fatal, but statistics show painkillers or opioids to be the biggest culprit for deaths relating to drug use in recent years. For those seeking help on how to prevent, minimize or identify drug overdoses, the Phoenix Center in Kamloops allows people to come in and recover, and will provide help to those who are on or coming off of drugs. The ASK Wellness Society in town also provides support to those seeking help.